Valuing the overall health and well-being of employees, providing opportunities for personal and professional growth, mental health education programs, and work place wellness plans – are all elements of a mentally healthy workplace that were honoured by CMHA Kelowna, November 22. 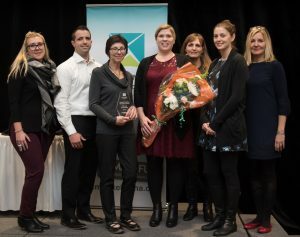 Mentally Healthy Workplace awards were handed out to a small and large business in Kelowna that demonstrated a commitment to fostering mental health in the workplace. 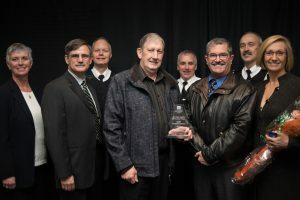 Pihl Law Corporation received the honour for small business while the RCMP Southeast District took the honours for large business. “It’s a privilege for Pihl Law to be recognized as part of a growing number of businesses and organizations who are making mental health a priority in their workplace. Purposefully building a mentally healthy work culture takes commitment and we believe that it’s important for leaders to start by taking a first step. Pihl Law leadership believes that prioritizing our team’s health is not only our responsibility and the right thing to do but also that the benefits of these efforts far outweigh our investment.” Jody Pihl, Pihl Law Corporation. More than two hundred professionals filled the room to celebrate the winners and hear the keynote address from Second Cup founder Frank O’Dea, who told the passionate story of how he went from homelessness to celebrated businessperson with the Order of Canada. Event attendees were also provided with low and no-cost mental health tools and resources they could implement right away in their places of work. According to the Mental Health Commission of Canada, in any given week more than 500,000 Canadians are unable to work due to mental health problems or illnesses. Subsequently, this costs the Canadian economy up to $55 billion each year due to days off work, lost productivity and disability claims.